I'm hosting a big party for my mom this afternoon and I woke up thinking about what all I might have missed in the preparation. I am 'Tizzy Lizzy' sometimes when hosting things. I read the devotional reading today in JESUS CALLING and it referenced the Bible passage where Mary and Martha are hosting Jesus. 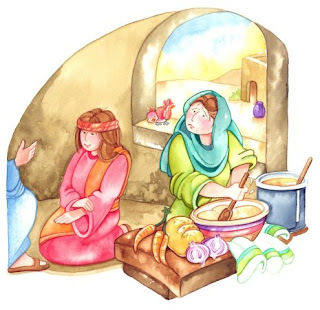 Martha is in a tizzy, thinking Mary ought to be helping in the kitchen instead of just listening to Jesus. Well, there's no Mary here this morning, but Martha is here big time. She is 'worried and upset', as Jesus calls her. Then he tells her Mary has chosen what is better, etc. It's amazing how I needed that. So now Mary is here, I'd like to think. AND WE'RE GOING TO HAVE FUN THIS AFTERNOON!!! Anyway, I'll post pictures later. ntlastNancy, thanks for sharing the "Mary Martha thing" ....small weakness of mine. :) Such a sweet daughter and blessed mother! Treasure the times...I know that you do!! Another Martha here.....I get so caught up in making sure everything is perfect, that I don't enjoy entertaining at all. I go to others' homes and they seem to be so comfortable entertaining, serving simple foods and just enjoying the time with their guests. Not me. Nervous wreck the whole time. How do I change??????? Anyway, anxious to see the pics. Was this a birthday party? Nancy, I DID get your comment, as you can see. Thanks!